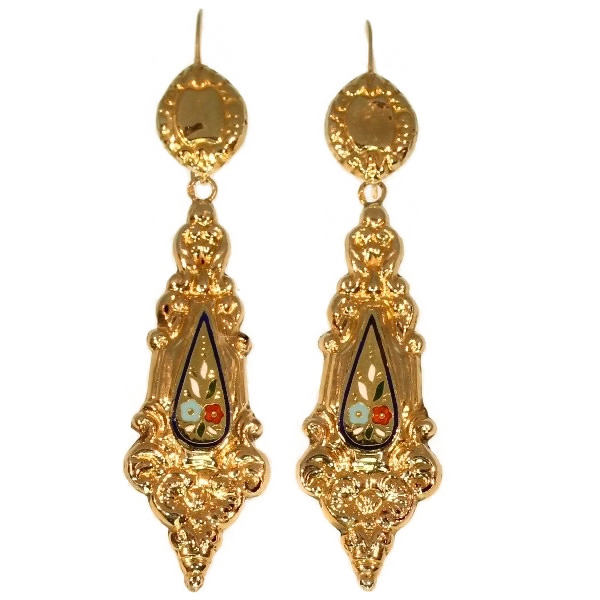 Antique enamel gold dangle earrings, Victorian era: Description by Adin Antique Jewelry. A flowery pair of Victorian dangle earrings, circa 1850’s, enamel colored flower, 18kt red gold, French wire, in very good antique condition… A touch of history. Style specifics: The Victorian period can roughly be divided into 3 distinct periods; the Romantic (1837 - 1860), Grand (1861 - 1885), and Late or Aesthetic Period (1880 - 1901). We consider this to be of the Romantic Period. During the early period, romantic and symbolic pieces were most favored and often included motifs of hearts, anchors, snakes and crosses. Also semi-precious gems including garnets, amethyst, coral, turquoise and seed pearls were highly favored.